Danny Thompson is relishing his new challenge at Hampshire Premier League outfit Fleetlands. The former Gosport Borough starlwart has moved to Lederle Lane with ex-Privett Park chairman Iain Sellstrom. Sellstrom has taken up the same post at Fleetlands, while Thompson has arrived as boss. 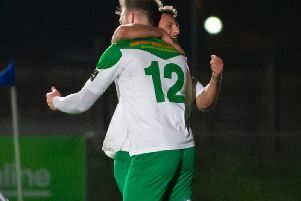 And the pair are determined to take the club back into the Wessex League as quickly as possible. Thompson said: ‘We have already made improvements to the ground. .There is a new manager’s office, treatment rooms and toilet blocks. ‘The place is starting to look more like a football stadium rather than a pitch in the middle of an airfield. ‘Iain is in negotiations with the owners to try to get a 12-year lease. That will help us make further changes. On the pitch, Fleetlands have inherited most of last season’s successful Gosport Borough reserve team. Borough disbanded their second string at the end of last term – despite their Wyvern Combination League and cup success under Andy Stone. Alex Searle, who was also involved, has joined Thompson along with experienced coach Dave Taviner. The transition was not easy for the young players stepping up into men’s football. Fleetlands lost their opening three games but since then have gone on a five-game winning run. Thompson is clear about his target for this season. The boss said: ‘We want to get out of the Hampshire League. ‘It isn't going to be easy because there are some good sides here. ‘Teams like Paulsgrove, Bush Hill and Infinity all have players who have played at a higher level. ‘Our team is growing in confidence, though, and we are pushing the top three. Fleetlands have also progressed in the Hampshire Premier League Cup. Liam Gauge struck twice, while Jordan Whiteley and Robbie Pittman were also on target.